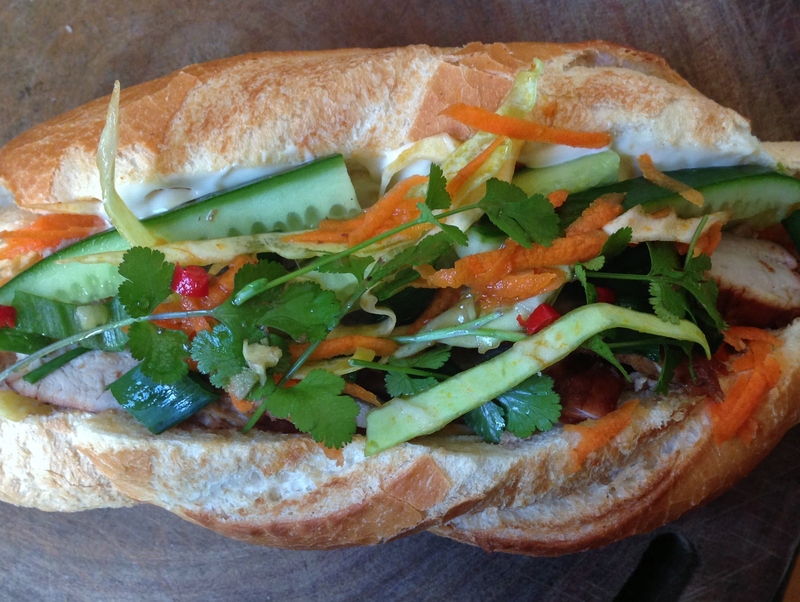 You can buy some very good pork rolls (or Banh Mi) in Footscray and they’re usually pretty cheap. Try To’s Bakery on the corner of Leeds and Hopkins Street or Nhu Lan a few doors further down in Hopkins Street. At both of these places you should be able to get pork roll satisfaction for around four dollars, a bargain in anyone’s book. The pork roll is an interesting dish in Vietnamese cuisine, it perfectly showcases the blend of Vietnamese ingredients and techniques with the French influences from their long period of occupation in the country. The baguette which is now ubiquitous in Vietnam is a French influence but the locals put their own twist on it adding some rice flour to the dough to make a lighter, crunchier version. 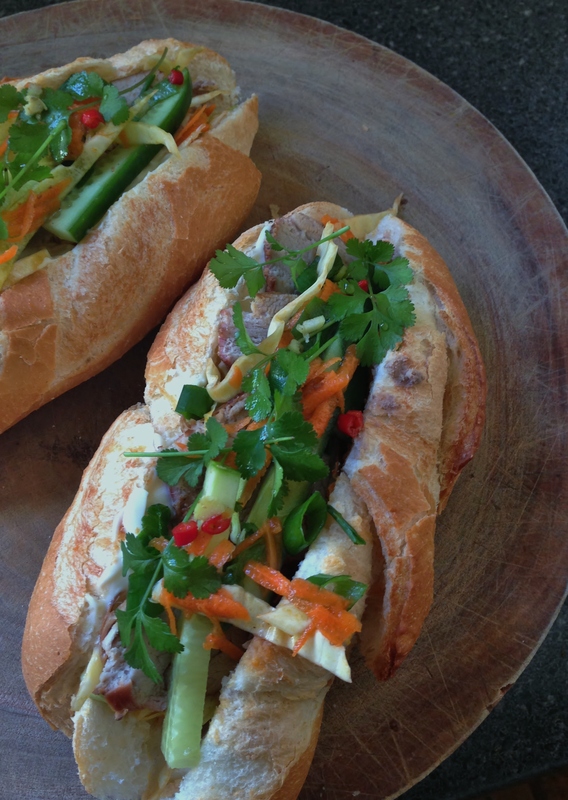 The pate which is liberally slathered on the baguette before the other ingredients are added is also a French influence but ultimately these popular street snacks are Vietnamese in flavour due to the marinated pork, Asian slaw and liberal amounts of coriander and chilli. Having tasted a number of versions I naturally decided to make my own. I found some excellent and cheap pork fillet at Phuoc Hung Butchers in Leeds Street, picked up half a dozen plain baguette rolls at To’s Bakery, some vegetables at Little Saigon in Nicholson Street and walked home via Seddon where I picked up some chicken and cognac pate from Bongiovanni’s in Victoria Street. When I got home this is what I made. Mix together the ingredients for the marinade and add the pork. Set aside for one hour. Roast the pork in a pre-heated 200°C oven for 20 mins. Reduce heat to 180°C and roast for a further half hour or until firm when prodded with your finger. Remove from oven and set aside to rest. Meanwhile, mix together the ingredients for the Asian slaw and the drizzling sauce. Slice baguette rolls lengthways, slather with pate and add a little Asian slaw. Arrange four or five slices of pork fillet on roll, add a little more Asian slaw and some mayonnaise. Top with some cucumber batons, lots of fresh coriander leaves and some fresh chilli, drizzle with the sauce. Serve.